Not a World Cup Soccer fan? How about a fan of pulling cards that sell on eBay for hundreds of dollars? 2014 Panini World Cup Soccer Stickers has a HUGE collector base throughout the world and here in south Texas. This Wednesday about 12:00, Panini will introduce 2014 Prizm World Cup Soccer to the collecting world. Soccer collecting will never be the same. Each box of 2014 Prizm World Cup Soccer has 24 packs with 6 cards per pack at $5.99 per pack and $108 per box. The base set consists of 200 cards with representatives from all 32 teams. Each box has at least 8 Prizm Parallels: Blue #d/199, Red #d/149, Purple #d/99, Green Crystal #d/25, Gold #d/25, Gold Power Prizm #d/5 and Black Prizm 1/1. Look for autographs of Pele, Lionel Messi, Cristiano Ronaldo and total of 50 stars from throughout the world. Autographs include the unnumbered base autographs, Prizm Autographs #d/25, Black Prizm 1/1 Autographs and Combo Signatures #d/10. James is a long-time Sports Cards Plus customer. James is mostly a vintage baseball collector and an avid Braves collector. When he saw 2014 Donruss Baseball for only $64.99 per box, the nostalgia of the old Donruss designs drew him in to try a box. 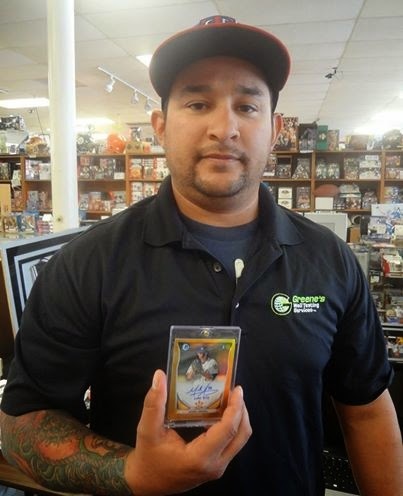 Here is James with his Mariano Rivera 2014 Donruss Elite Series Autograph 1/10! James said this is one Yankee card he might have to keep. Benny knows well The Legend of The Super Hit Factory. Benny was one of the first to pick his box when 2014 Bowman Baseball arrived (Hobby $74.99 & Jumbos $159.99). Here is Benny with his Mark Appel 2014 Bowman Chrome Gold Refractor Auto RC #d/50. Don't worry. We still have plenty more 2014 Bowman Baseball boxes filled with Super Hits waiting for you. Nate and his son Spencer came in looking for Super Hits. Nate tried a box of 2013 Topps Five Star Football for only $389.99 and pulled a Mathew Stafford Auto #d/115, a E. J. Manuel Auto RC, and a redemption for a Eddie Lacy Auto Quad Relic Book. Not bad. Spencer tried a box of 2012-13 Select Basketball for only $104.99 and showed dad how it's done. Here's Spencer with a Gold Damion Lillard Hot Rookies card #d/10 and a redemption for a Kobe Bryant Auto Patch Prizm Refractor #d/25. Rene knows THE BEST CASES in The Hobby are at Sports Cards Plus. He found 2012-13 Elite Basketball for only $69.99 was the way to go. 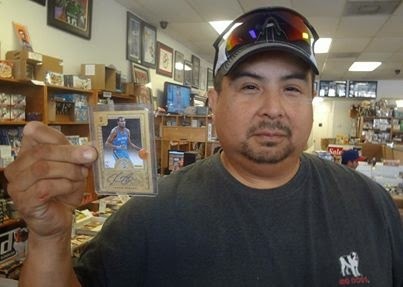 Here is Rene with his 2012-13 Elite Passing the Torch Kevin Durant George Gervin Dual Auto #d/25. 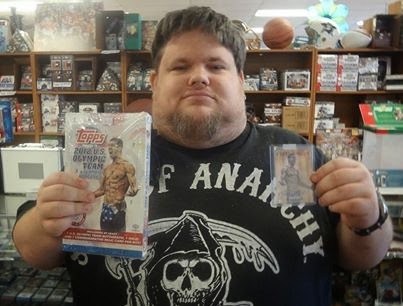 David is a fan of 2012 Topps Summer Olympics Heroes for only $59.99 per box. Here is David with his Michael Phelps Auto. So what are you waiting for??? Sports Cards Plus has The BEST CASES in The Hobby and our LOWEST PRICE EVER SALE. Pull your Super Hit and enter our Drawing for $500.00. Come on in and have some fun.